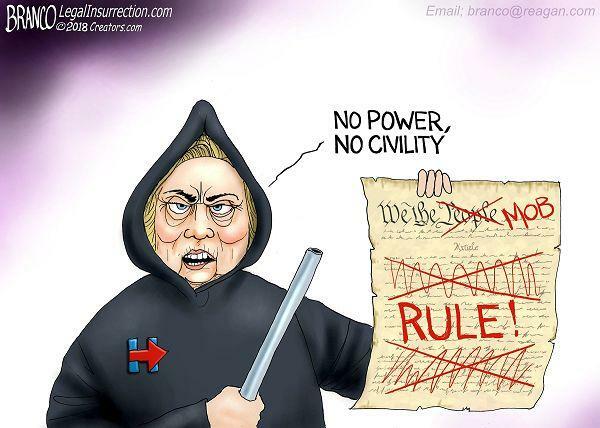 Branco’s take on Hillary Clinton’s most recent declaration in support of nationwide violence in order to restore Democrats to power is sadly right on point. The question now is if enough voters are paying attention and are rightfully disgusted by the far left’s constant enthusiasm for violence in the streets and will then vote accordingly this November and punish them by voting Republican. Mrs. Clinton is speaking words of outright fascism in which a select few elitists will hold absolute power over the words and thoughts of the masses—and many among the Establishment Media are applauding her message. It is once again up to YOU, the voter, to set this right. Any and all Democrats running today should be a resounding NO vote. Sadly this isn’t an exaggeration as dissenting opinions are being banished across all social media forums. Liberalism no longer exists in America. It’s outright fascism these days – and it’s getting worse.